We manufacture near to mid infrared frequency standards for the calibration, metrology and gas sensing industries. Our components are installed in thousands of products around the world. These standards rely on the principal of molecular absorption – particularly on the vibrational and rotational modes of molecular gases such as acetylene, hydrogen cyanide, carbon monoxide and hydrogen fluoride. Molecular absorption frequency standards have the distinct advantage of being relatively insensitive to changes in environment and over time, and they are inherently traceable due to the fundamental physics of molecular absorption. 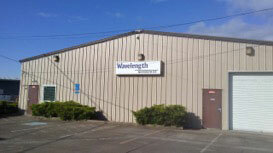 Founded in 1998 by Stephen Blazo, Wavelength References now occupies a 4000sq ft facility in Corvallis, Oregon. We are a small but dynamic company that welcomes fresh challenges within our broad mission. Our customer list includes Universities, US national Research labs and most of the major corporations in fiber optic T&M and sensing systems. We consistently refer to organizations in the standards community such as NIST (National Institute of Standards and Technology), HITRAN (HIgh-resolutionTRANsmissionmolecular absorption database chaired at the Harvard-Smithsonian Center for Astrophysics) and PNNL (Pacific Northwest National Laboratory) for molecular absorption information and verification. We have extensive contacts in the standards community with organizations such as NIST .